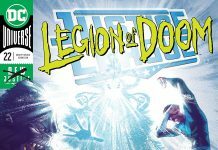 SYNOPSIS: It’s a mystery in space: Why would the Guardians of the Universe hide top-secret intel deep in the bowels of a secret vault on Thanagar Prime? That’s what Martian Manhunter, GL and Hawkgirl want to know! That’s not the only puzzler popping off either, as an ancient connection that bonds Kendra and Shayera Hol unlocks the secret of the map on Hawkgirl’s Dark Metal wings. Back on Earth, Starman and the Trinity look to create a wormhole that could transport them to Thanagar Prime. The only catch? It could vaporize them! 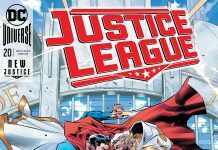 If Justice League #15 was a step in the right direction, #16 is a giant leap forward, not just for mankind, but for all of DC’s existence. There’s a tricky thing about playing the long game in storytelling. Typically it’s easy to get lost in the middle part. There are so many threads getting woven in different directions that attention is split among them and things can get muddled quickly. When it’s done effectively, the payoff starts to come together quickly and almost by surprise. 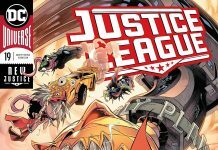 Justice League has become the focal point for a story that Scott Snyder has been crafting for over a year now. There have been countless tie-in’s, arguably too many, and the narrative structure has been stretched to its limit. 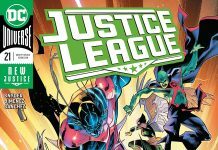 From Dark Knights Metal to New Justice, the Totality of the DC Multiverse has been at play, but in the last two issues of Justice League things are finally starting to take form. 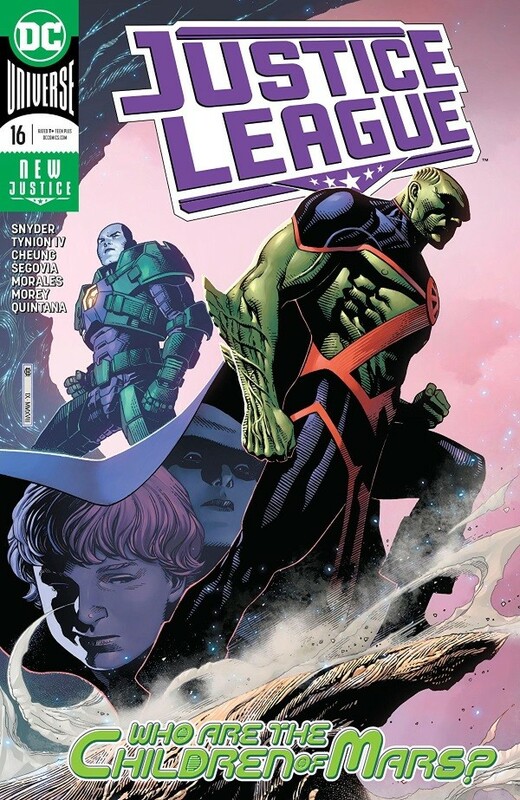 Justice League #16 wraps up a three-part story focusing on the existence of Thangar Prime and its secrets. In fact, the story arc serves as a sort of dissertation on the very nature of a secret. It’s high concept storytelling and, if you aren’t careful, it’s easy to lose grasp of its threads. 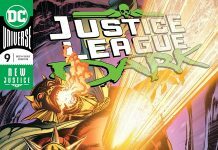 Snyder’s storytelling is again in the hands of James Tynion IV, and while Snyder is the architect here, Tynion serves as the construction site manager, making plans into reality…or versions of reality. 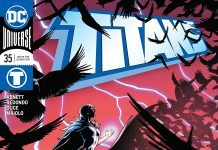 Tynion is too often overlooked from a writing standpoint in the current unfolding of the DC Multiverse. He does the dirty work, putting words and dialogue to a tale that is hard to describe. While some readers may find his approach a bit too dramatic or highfalutin there is a real sense of grandiosity and poetry at play. 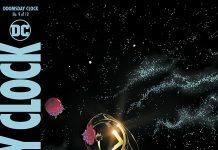 Narrative prose in this issue is compelling and descriptive, if at times less than accessible. What does it mean to create? What are the negative energies formed in bringing existence into being? What power does a secret hold and what happens to that power when the secret is destroyed? Imagine having to write characters exploring these themes in a plot structure that moves storytelling forward without becoming an exercise in theoretical eye-rolling. 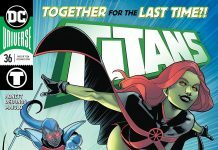 Granted, Tynion sometimes gets a bit carried away with symbolism, seen in a bit of dialogue highlighting “Justice and Doom” that reads a bit on the nose given the heroes’ and villains’ team-identities, but he handles the subject matter with more grace than to be expected and delivers a stellar issue of the series here. 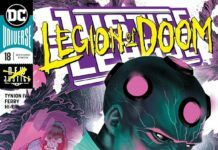 Jim Cheung and Stephen Segovia’s artwork is crisp and dynamic. It’s been mentioned before, but the two artists’ styles feed into one another without causing a distraction and serve the dense subject matter so well that the plot line is enhanced with their work. In the hands of other artists, readers might get lost in the density of subject matter, but attention to detail, clean lines, and dynamic motion in both action and quiet scenes make the story easy to follow and engrossing.